32 graduating seniors from the Lansing School District were recognized recently at an awards ceremony. These Upward Bound participants celebrated and reflected on the program's challenges and successes. Michigan State University cares deeply about the success of students, not just those who are on its campus as undergraduates or graduate students. On April 30, 2018, 32 graduating high school seniors from the Lansing School District were honored at the Upward Bound Senior Recognition Awards Reception, held in the MSU Union Ballroom. These students had participated in Michigan State University’s branch of Upward Bound for at least the last six months, up to the last four years. The program is designed for students who are interested in pursuing education beyond high school from low-income families, and from families in which neither parent has a bachelor’s degree, to promote college readiness. Students are identified and recruited through high school counselors. These students are often the first college-bound of their families. As part of Upward Bound, students commit to attending regular meetings outside of school hours, community service projects and cultural experiences, and summer travel programs to places like Niagara Falls, the MSU campus, and the Michigan State Capitol. In addition, they receive academic instructional sessions in the areas of math, lab science, composition, and literature from MSU teaching assistants, and mentoring from MSU students. They’re given a breadth of experiences that colleges look for in applicants and additional insights to help them grow and be ready for college. Upward Bound is typically a federally funded program through the U.S. Department of Education’s TRIO grants. Upward Bound has been in partnership with MSU for 52 years. In 2017, however, it was unclear if Upward Bound at MSU would continue. It lost federal funding due to unforeseen circumstances and was going to be dissolved. But senior MSU leadership decided that MSU would provide a large portion of the funding to maintain the university’s commitment to pre-college students in the greater Lansing area. Even with a smaller staff and new director, they experienced a period of growth over the past year, growing from 91 to 125 enrolled students. At the awards reception, Dr. Stephanie Anthony, Upward Bound Director and Program Coordinator since the fall of 2017, recognized the students for their perseverance and hard work, and the parents for their encouragement and support. She also recognized the many partners of Upward Bound beyond MSU: The Lansing School District, benefactors, staff members, teaching assistants, and college student mentors. Several seniors shared meaningful aspects of the program. Steven Bonham, a senior from J.W. Sexton High School, and recently named one of the Twelve Distinguished Young Black Men of Lansing, said that he really appreciated Upward Bound’s assistance with planning and preparation for the college classroom, and the time management skills that he learned. Asia Ruiz-Newton, senior from Everett High School, and said she was most impacted by the access that Upward Bound participants had with college student mentors. Mentors “shared what to expect, and what [college] classes are like.” She also appreciated hearing directly from MSU programs who were recruiting students. 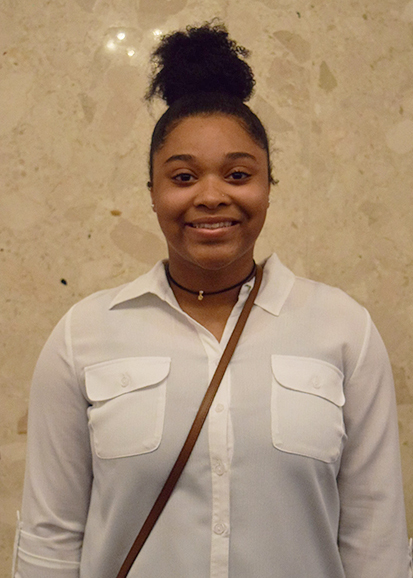 She felt a connection with Lyman Briggs College, and decided to attend there this fall, studying to become an orthodontist. 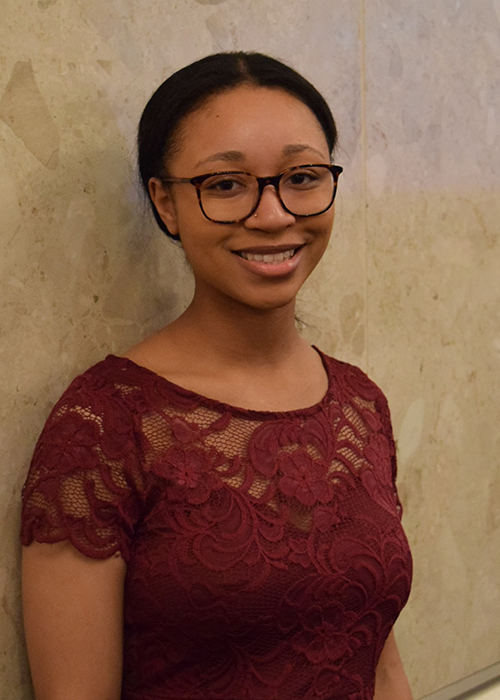 Andrea Kent, another senior from Everett, who will attend MSU’s Broad College next year, studying to eventually be a restaurant owner, shared the significance of personal connections with the Student School Liaison, an MSU student. It meant a lot to Kent that the liaison would regularly check on students throughout the year. This year, James Madison College junior Emily Piccione served as the Student School Liaison, establishing regular contact with teachers and counselors, and making sure students were alright if they missed Upward Bound sessions. In his remarks on behalf of the Office of the Associate Provost for Undergraduate Education, MSU professor Dave Weatherspoon shared that there are predictive factors correlated to how one might do in life, based on any number of circumstances and opportunities. He encouraged the graduating seniors to understand these factors, and to challenge them. The encouraging news is that some positive predictive factors for student success and persistence include participation in pre-college programs like Upward Bound. MSU has a commitment to advancing knowledge and transforming lives. The Upward Bound program has transformed the lives of those 32 graduating high school seniors. This year, the program has the largest number of MSU incoming first year students: more than half of the graduating seniors will be attending MSU in the fall of 2018. Welcome, Spartans!